You can read my review of the first novel in this trilogy, The Boleyn King, here and the second novel, The Boleyn Deceit, here. 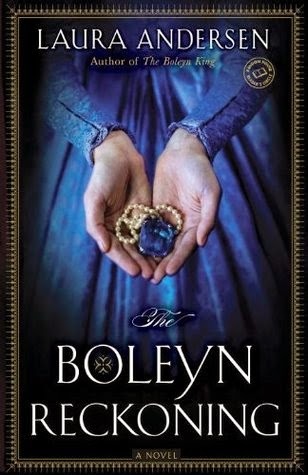 I've been waiting for this book since I read the last word of The Boleyn Deceit. I'm always wary of alternative fiction, but this series completely sucked me in to the very last page of this, the last book. I read each of the books in this trilogy as they came out, which meant that there was a substantial period of time between my readings of each book. If I had it to do over again, and I would recommend to anyone who is interested in these books, to just binge read the three, one right after the other. None of these, at least of all The Boleyn Reckoning, is a standalone book. I thoroughly enjoyed this book. I never knew where the plot was going, and that rarely happens to me anymore. Three of the four main characters--the three fictional ones--were all dynamically written. And the fourth, Elizabeth, was--to me--the most interesting of all. Of course, I don't know if I can give all the credit to Andersen for that. Let's face it, Elizabeth I is one of the most captivating women in history. I had only a few minor complaints, and that really reflect on the series as a whole and not specifically this book. I felt some of the secondary "real" characters, such as Jane Grey and Mary Tudor, sort of appeared and disappeared throughout the book and I wish they would have been more present throughout instead of just appearing here and there. This is not meant as a criticism--if anything, it is a compliment--but I felt a little off my bearing by this whole series. I am quite familiar with this period in history (it was my major! ), but I kept forgetting that these books were fiction and the at William, Dominic, and Minuette never existed and that none of this ever happened! Unless you are a hard-core purist and accuracy-fanatic when it comes to historical fiction, I would recommend this series to anyone. However, as I said, you need to start at the beginning and read straight through to the conclusion.